16 year old female presented with full ortho maxilla and Mandible. Patient had been in ortho for 2 years. 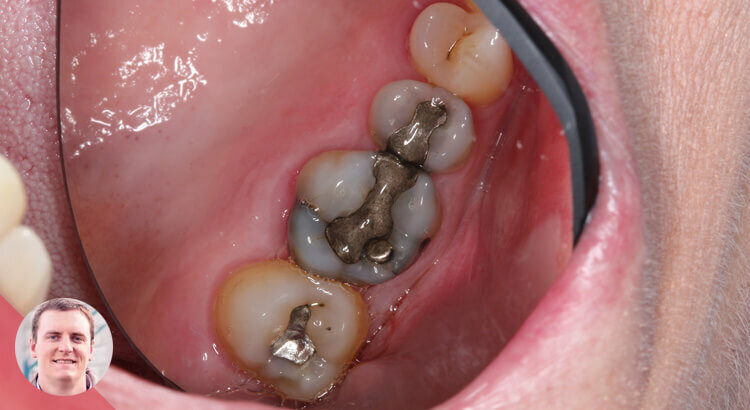 Patient had very poor oral hygiene and presented with generalized decay in posterior and anterior, as well as deep carious lesions around ortho brackets. I called referring orthodontist to discuss case and patient’s hygiene regimen. Orthodontist stated that patient’s ortho treatment plan would last at minimum another year if we continued treatment. We made the decision to discontinue orthodontic treatment to address deep decay and improve oral hygiene. A few posterior teeth with deeper decay were addressed first and then we addressed anterior teeth following prophylaxis and a few weeks of healing. Full extent of decay was visualized following removal of brackets. 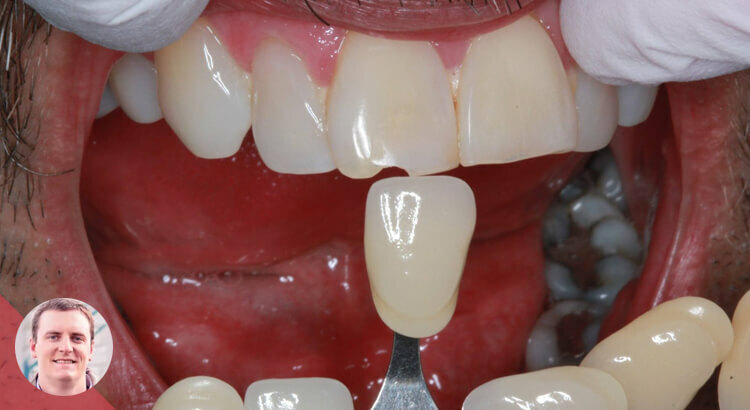 Treatment plan included restoring anterior teeth with composite restorations with future need for full coverage crowns once patient’s homecare improves. 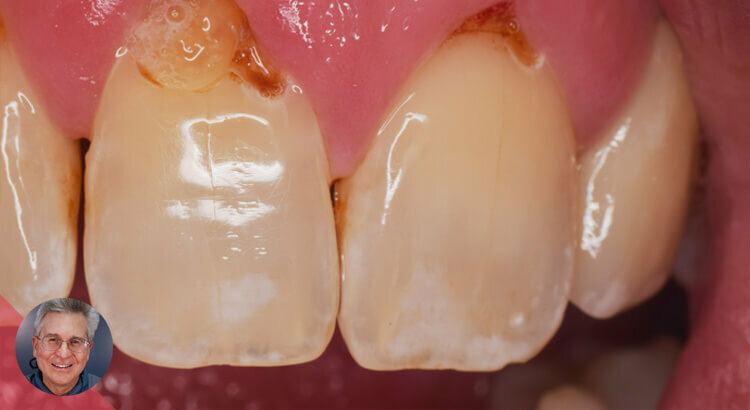 Patient was seen in one visit to remove maxillary anterior decay and restore with Filtec Supreme Ultra composite. Greater curve bands were used for all restorations. Pictures show pre-treatment and post treatment, with a 2 week follow-up. 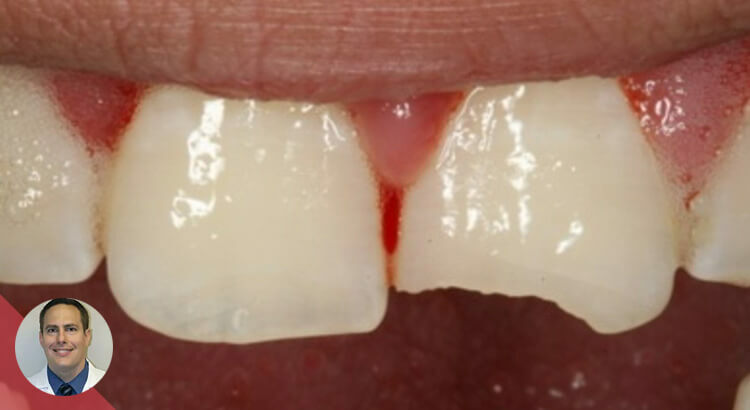 Summer is the period of fractured incisors in pediatric patients! I am doing this kind of work every week! Creating a color blend for Class V’s can be frustrating. Give this technique a try. As an added bonus you will realize a stronger bonded restoration. Using SureFil SDR flow as the first layer over the entire surface of the prep creates a low stress strong bond to dentin. The SureFil also creates a semi translucent layer which is covered by the Filtek Supreme Ultra “Body” layer. 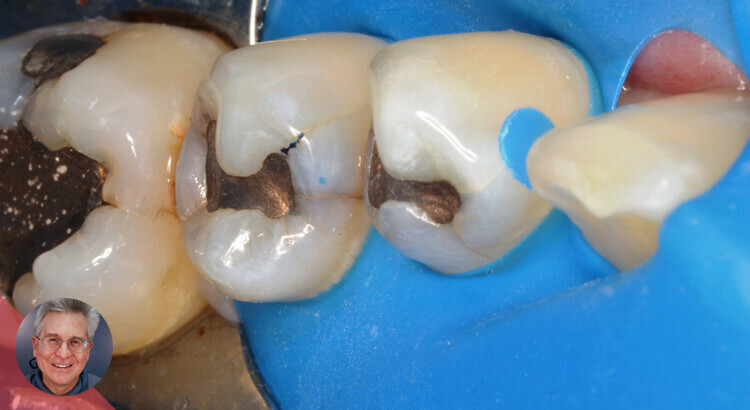 The result is a blended composite that reflects light much like the surrounding tooth structure. If the color is off, the result will still look respectable. I posted this technique before but wanted to show it with a little more detail: link to technique. 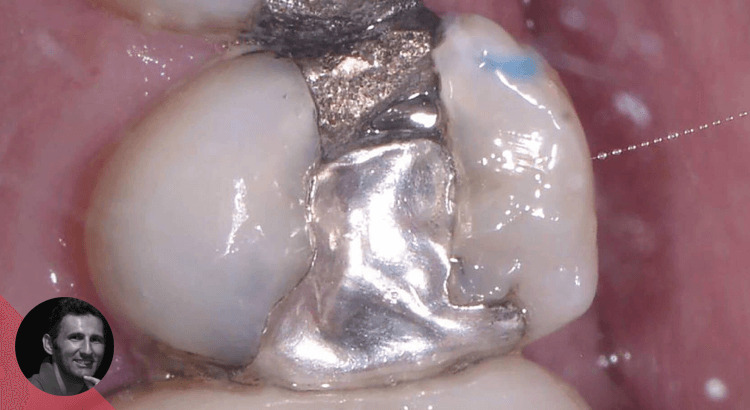 #3 has distal decay, existing large MO filling, separate buccal and lingual amalgam fillings and some ugly looking cracks. Tooth is periodontally involved and is also unopposed. What do you do for this tooth? In my view it’s only value is for esthetics unless she opts to restore the bottom. Considering that and the perio, I hate to recommend an expensive crown. I would also hate to try an MODBLXYZ filling. This is the perfect scenario for the poor man’s cerec crown. 1. Preop dual arch impression. 2. 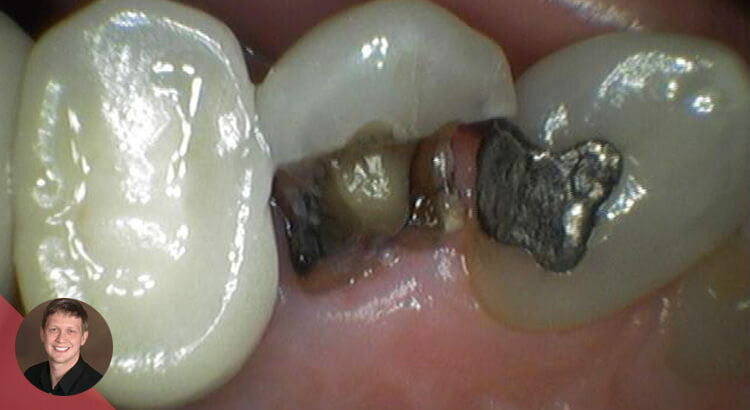 Remove all decay and old restorative – in this case that didn’t leave me with much othere than a few thin cusp tips. 3. Prep for full coverage staying supra G where possible and preparing a nice readable should margin and smooth edges- much like a cerec prep. 4. 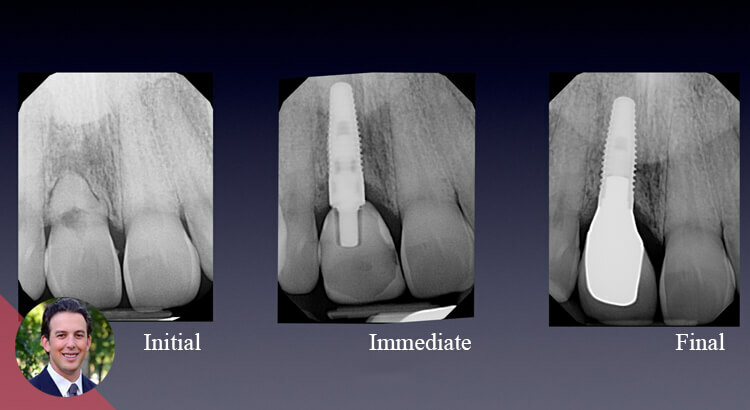 Using the impression, place dual cured composite (I use Injectafill) in the tooth site just as you would to make temporary. 5. Remove at exactly 1:30 sec. 6. Allow to self cure or hit it with light. 7. Trim as you would a temp- gotta get this part right becaus this is the definitive restoration. You can leave a little excess buccal and lingual as you’ll have access to finish the margins. 8. Try in and verify fit. 10. Bond as you would any other composite/all ceramic crown. 11. Clean excess, finish margins, adjust occlusion (shouldn’t be much to adjust given that it is identical to their original tooth. 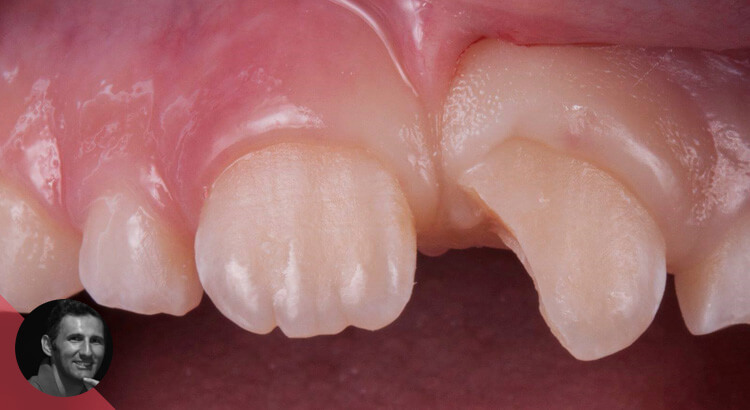 Have been asked about some tips for direct composite, especially on how to get symmetrical central incisors. This is a simple tip, but I rarely see it being done. Heck, it took me a long time to implement it. Here is how I messed up, and hopefully learned from it. I’ve taken a number of courses and have seen some great cases on here with margin elevation, so I found a case worthy of trying my hand at it. I would really like some feedback for those of you who’ve done a number of these. The patient had mild sensitivity on the gingiva for a few days but said it has felt fine since. Overall I thought the tissue looked pretty good considering. 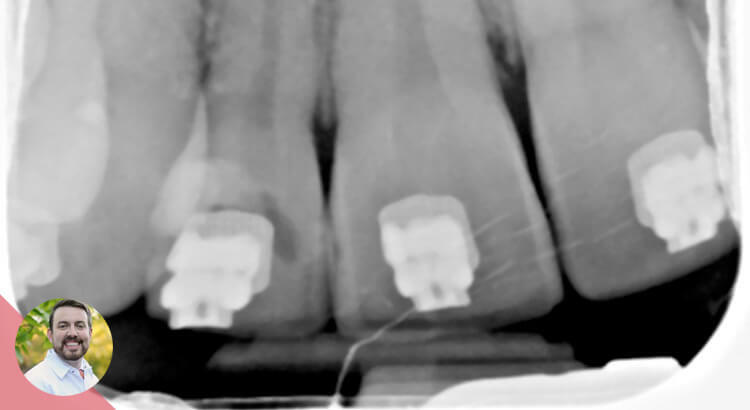 I bonded on an emax crown and the margin height made the process easy and ensured complete isolation. We ran out of time so no final crown pic or XR.